A cute little “vixen” of a witch standing with her hand on her hip and saying “The West? 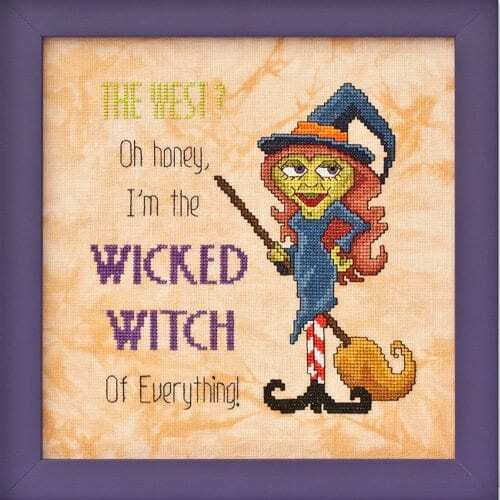 Oh honey, I’m the wicked witch of everything!” I don’t know about you, but on occasion, I could easily slip into this persona! Fabric: Stitched on 28ct “Chalice” Cashel Linen by Picture This Plus. Suggest purchasing a fat eighth (13″ X 18″). Available from Glendon Place, see below. Design Area: 6-7/8″w X 7-1/8″h. Fibers: Uses a total of 23 colors of Sullivans floss. DMC and Anchor comparable colors are also provided. Design has 1/4 stitches only in the witches face.